Some people find it hard to let Star Wars go; fans can't seem to let things go, writers can't let go of Star Wars either, and find themselves writing even more for the universe, and out of all of them, George Lucas can't let it go. (Except for the time, he let it go to Disney and thus, all the recent Star Wars movies. Anyways...). 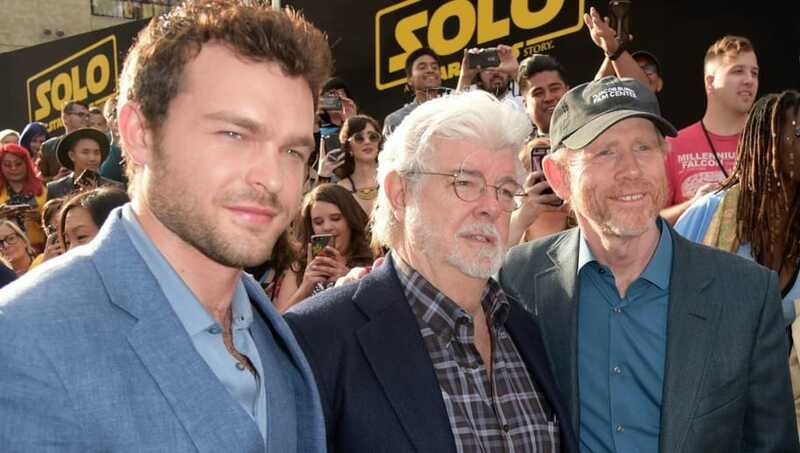 When talking about a scene in the upcoming movie, Solo, director Ron Howard ​​revealed that George Lucas stopped by to say 'Hi' and ended up staying for five hours, present to give Howard some guidance and a push in the right direction about the Star Wars universe. When it came to the cape-in-the-closet scene between Han and Qi'ra who is looking to be Han's lady love in this early time frame, Howard said initially Han was was supposed to hang Qi’ra’s cloak after she took it off, but Lucas had a better idea for the scene and offered his opinion. Apparently, there was also another scene in the Millennium Falcon where Lucas had asked, "Why doesn't Han just do [this]?" But the scene was too spoiler-y for Howard to reveal, so it looks like fans will have to wait and guess at the part where Lucas' opinion could have played a part. Solo: A Star Wars Story will be released on May 25, but for any of those that want to see it early, some theaters have early showings tomorrow evening.